Apple design chief Jony Ive and longtime collaborator Marc Newson's take on the London hotel Claridge's Christmas tree has been revealed – and perhaps not surprisingly, there's not a bauble in sight. Our aim was to create an all-enveloping magical experience that celebrates our enormous respect for tradition while recognising our excitement about the future and things to come. There are few things more pure and beautiful than nature, so that was our starting point, layering various iterations of organic forms with technology. Design and style magazine Wallpaper described a scene in which a series of vast four meter-high light boxes line the walls, illuminating black-and-white images of snow-capped silver birch trees, against which "towering cast models of Scots pine rise to a canopy of natural green pine". The accompanying forest soundscape begins with a dawn chorus and features owls, nightingales, sparrows, and foxes. Synced to the audio is specially choreographed lighting that cycles from sunrise to nighttime, creating a dappled effect in the installation space. At the center of the grove, a smaller sapling tree appears to grow in the transitions of light, which the designers describe as a symbol of the future. 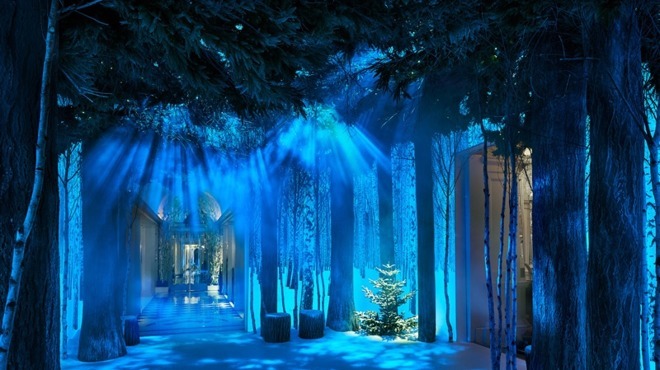 The installation is open to the public and free to enter, and will remain in London's Claridge's hotel throughout the festive season. Must say.. They did an awesome job hiding all the dongles needed to power all of that. Because Jonny is too busy designing Christmas trees to be worried about updating the Mac line of products? People seem to have this mistaken notion that Ive exists solely to design Apple products and nothing else. (Braces for next wave of utterly inane criticism and trolling). On a side note, why is this in the Mac blog? Braces - Is that because its a case of the emporers new clothes? "Daddy, can we see the tree now"
"Yes son, there it is." "But daddy, its just a tree"
"No son, its a magnificent tree, can you see how much design has gone in to this, its a marvel, it took a long time you know." "Yes daddy, but its just a tree"
the Mac Pro has yet to be updated in 4 years. Umm no. People have this "mistaken notion" that sometimes, say, one day every other year, Ive should care about Apple products. Unlike the last five years when he was too busy designing christmas trees. Do you think when Jony and Marc whipped the sheet off it, and revealed it to the salivating Claridges audience, they all just looked at each other and blinked in disbelief like in those awkward SouthPark scenes? They be like: "Did you forget to decorate the tree?" The bare tree is meant to symbolise the roadmap for desktop Mac announcements.